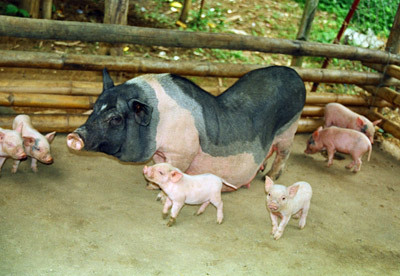 Mong Cai Pigs are one of the most common breeds of Pigs in northern Vietnam, particularly in the provinces of North Mountain area, the Red River delta, and the northern part of the Central Coastline. Mong Cai Pigs are small to medium sized. Their heads are black with small and upright ears. Black patches are also found other places on their body with a white band running from one side of their abdomen over the shoulder to other side of the abdomen, making a black saddle over the middle of their concave back. They are known for high prolificacy, good adaptation to poor-quality feed, and disease resistance. Gilts reach puberty at 2-3 months of age and they have an average litter size of 12.